Perseverance is a mind that is happy to practice Dharma. The easiest, most powerful way to have perseverance is by reflecting on impermanence and death. First reflect on how precious this human body with eight freedoms and ten richnesses is, how you can achieve the three great meanings with it, how it will be difficult to find such a body again and how you will have it just this one time. On the basis of this, remember that death can happen at any time. Impermanence and death is very powerful--the most powerful meditation for us beginners. Also, relate impermanence and death to negative karma and its result, rebirth in the lower realms. Remember again and again the unimaginable sufferings of the hell beings, hungry ghosts and animals. As Nagarjuna explains, we should remember the hot and cold hells every day. Nagarjuna advises this because when we think of the hot and cold hells we have no space in our mind for attachment and anger, these negative emotional thoughts that disturb and obscure our mind. Whenever thoughts of the happiness of this life comes, we delay or stop our practice. Whenever attachment clinging to this life comes, laziness comes, and we don't want to practice. We want to spend our time enjoying the comforts of this life instead of practicing Dharma. At that time we should remember that death can happen at any time. Then what happens after that? The most unbearable suffering. We can't bear even a small problem in this human realm; we can't bear to have a headache, a toothache, some stomach pain or even to be a little hot or a little cold. When we experience even a small problem in this human realm, because we can't bear it, we give up practicing Dharma. Death can happen any day, any hour, any moment--even this moment. And what comes after death is the lower realms. As Nagarjuna advises, we should remember the unbearable sufferings of the lower realms. Negative karma is very extensive. It's not limited to just the ten nonvirtuous actions, but within the ten nonvirtuous actions are those nonvirtues that we collect many times every day--though we mightn't kill or steal. 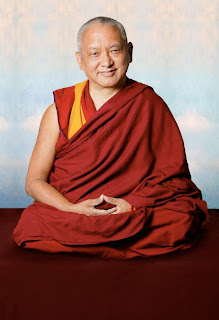 However, His Holiness Ling Rinpoche once made the comment that the subject of stealing is extensive and detailed. It depends on the individual person, but we generally commit many of the ten nonvirtues many times in one day. We also break the vows we have taken: pratimoksha vows, lay or ordained; bodhisattva vows; tantric vows. This is talking about just today. The negative karmas we have created from the time of our birth in this life are unimaginable, and then there are all the negative karmas we have created in beginningless past lives. In his lam-rim teachings, Pabongka Dechen Nyingpo says that an ordained person being careless about and not immediately confessing a downfall is heavier negative karma than having killed one hundred human beings and one hundred horses. (I don't think it has to be only horses--it can be any animal. In the past in Tibet they used horses a lot as there were no cars.) If you have taken ordination and are intentionally careless about your vows, this is how heavy the karma that you create is. It is also very useful to think about people you know who have died, like Andrea [Antonietti], the Italian monk. On my advice, he took ordination for a second time and died as a monk. Many of us here, those who have been here in Bodhgaya and in Dharamsala many times, will remember Andrea. He was an old student, an Italian, who was a monk before. He then changed his life, but before he died, while he was sick, he again took ordination. Now he's gone. He doesn't exist. There's no Andrea. Before there was Andrea, but now there's not. Before we used to joke and play with him and enjoy his humble, good personality, but now he doesn't exist. Think, "It is the same with me. There will come a time when I don't exist any more, a time when I'm not here in this world. This could happen at any time. By this time next year, I could be the same as Andrea, whom we can't see, who doesn't exist in this world. This could happen. By this time next year, I could be like that--not to be seen in this world. Some people have Andrea's malas and other possessions; the same thing could happen to me. Any day this could happen to me." If we really bring our attention inside, if we really think about the nature of our life, impermanence and death, we realize that our death could happen at any time and, in particular, all the unimaginable sufferings of the lower realms could happen at any time. Relate this to all the negative karmas you do--in one day there are so many, like rainfall. Committing one complete nonvirtuous action has four suffering results. One of them is creating the result similar to the cause, which means doing that action again, which again produces four suffering results, one of which is creating the result similar to the cause, so you commit the action again.... It goes on and on in this way. Committing one complete nonvirtuous action, from the ten nonvirtuous actions, produces suffering results that go on and on and on, so that there is unending suffering of samsara. Since committing even one negative karma from the ten brings this endless ongoing suffering, you can't stand it. You have to get rid of it, purify it, immediately. It's as if you have swallowed some poison and could die at any time. It's as if a poisonous snake has bitten you: the poison is spreading and you could die at any time. But ingesting poison or being bitten by a poisonous snake is nothing. That alone can't make you be reborn in the lower realms, but your negative karma can. I've been talking about just one negative karma, but we have created so many negative karmas today, in this life and during beginningless past lives. There's no way you can stand it--you have to purify it all right away! And at this time, by having received this perfect human body, you have all the opportunities to purify it. If death comes before you have purified your negative karma, you are finished. When will you meet Dharma again? When will you be able to purify all those negative karmas? When will you be able to actualize the path? It is extremely difficult to say. Fourth, even though you attempt to practice tantra, it will be like achieving hell. Even though you practice tantra for many years by not sleeping, not eating, not talking and living alone in a cave, it will be like achieving hell. Why? Here you have to understand that when you make a mistake in devoting to the virtuous friend-even showing some small disrespect, criticizing them, harming them or giving rise to negative thoughts--it is so heavy that even though you are practicing virtue and collecting merit by doing retreat sessions, it is very small compared to the heavy negative karma you have collected in relation to the virtuous friend. That negative karma is so huge that any virtue you practice by reciting mantras and so forth becomes insignificant. The negative karma is overwhelming, and you are reborn in the hell realm. This is what happens unless you change your mind, stop following those negative thoughts, recognize the mistakes you have made, confess them to the guru and purify them. By using logical reasoning and the quotations from Shakyamuni Buddha and Vajradhara, you have to transform your mind into devotion by seeing the guru as a buddha. It doesn't mean that you have no hope--it's not saying that. There's hope, if you change, if you recognize the mistakes you have made and, with strong regret, confess and purify them. In order not to commit the mistakes again, you then have to keep your mind in devotion toward that guru. You can change; it's not saying you can't change. But if you don't change, no matter what practice you do--many years of chanting mantras in retreat with no food and no sleep--even though you may be collecting merit, it will be insignificant compared to the heaviness of the negative karma you have created. Even though you attempt to practice tantra, it will be like achieving hell. As long as you don't change, it will be like achieving hell. Instead of achieving enlightenment, you'll be achieving hell, because that karma is so heavy. As mentioned in the motivation for taking the Eight Mahayana Precepts by my root guru, His Holiness Trijang Rinpoche*, which is similar to the motivation for taking refuge in Jorchö, if you think of all the endless sufferings of samsara that you will have to experience, particularly those of the lower realms, you don't dare to eat or sleep. When you're very frightened, you can't eat, or even if you do manage to eat, you vomit. If you think of all the past beginningless sufferings of samsara, in particular those of the three lower realms, it's something that cracks your heart. It's very frightening.